Have you ever heard that saying, “Misery loves company”? It seems crazy, but I think it’s true. 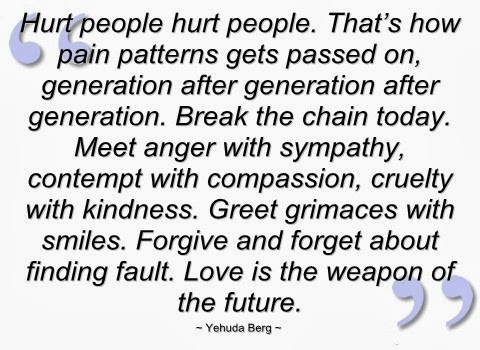 Hurting people tend to hurt others. They are so miserable, for whatever reason, that they choose to live in a way that makes everyone in their path feel bad. Someone close to me is a manager at a big retail store. Every few months it seems like someone just wants to take their anger out in the store. They want a special discount on an already marked down item, or they want to complain about not enough staff helping in a department. I can understand wanting help or a good deal, but some people take it overboard. I was reading through Proverbs 17 this morning. My friend Mrs. Laurel suggested that we read through Proverbs and start on the chapter that matches the date. So, that’s what I did this morning. Proverbs is full of amazing nuggets of knowledge and truth. I found some good Scriptures to go with what my friend dealt with yesterday. People who want to start a fight are only doing it because they are not joyful. Something is missing within their heart that causes them to just treat everyone like dirt on the bottom of their shoe. It’s smart to not start a quarrel. This friend of mine had an angry man yelling and cussing yesterday. In order to not make things worse, staying even tempered and using words with restraint got this man out of the store and no one was harmed. It could have gotten nasty though. You see, satan wants us to fight and cause problems. He wants to keep people at each other’s throats and angry. Some hurting people do not know how to handle their pain, so it spills out into every place in their lives. They can seem mean and just out right horrible, but there is probably a story there. Maybe that man’s wife left him yesterday. Maybe his wife has passed away and Valentine’s day was her favorite so he missed her terribly on Friday and it just spilled over into Sunday. There is no telling what his pain was stemming from. Here is the deal: you never know someone’s story. There is probably way more going on than we will ever know. Give people grace when you can. Don’t let them threaten or hurt you, but try to talk them down with knowledge and restraint. Don’t add to their anger by getting angry yourself. If you are on the other end and hurting, please don’t take your hurt out on innocent people. They don’t know what is going on with your life. Getting upset and yelling, cussing and threatening someone else will only get in you trouble in the long run. Get help for your pain. God is there for you and He has placed people in your life to help you.